Belonging from a landlocked country, the thought of living near sea or ocean has always astounded me -waking up to the sound of sea waves, going for a dip when it hits the 30s and getting vitamin D (and sea), just perfect. So, with rolling hills surrounded by water body, Geelong has the best fusion of landscape and is one of the most beautiful places to live in. 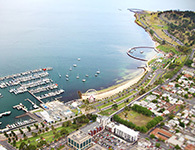 I had heard quite a lot about Sorrento, a beautiful and historic place lying on the tip of the Mornington Peninsula, so when my mum was around in Geelong for few weeks, we planned for a Sorrento trip. As an international student, I rely heavily on public transport and I was a bit skeptical about travelling that far - I was wrong, and if you are someone like me without your own vehicle, worry not, because the public transport is really convenient. I had done my bit of research on bus and ferry timings, we had packed our snacks, beach mats, put on extra sunscreen and we headed off to Geelong station. We boarded onto bus no 56 at around 9:15 am heading towards Queenscliff. The view along the road was mesmerizing as we passed through Ocean Grove market and Lake Victoria, I was filled with excitement to board the ferry. After about an hour, we got off at the last stop in Queenscliff. We had a bit of a rush to reach the ticket booth as we wanted to take the ferry that was departing in the next 5 minutes. The price was reasonable at $26 for both ways and with the ferry departing every hour till 7pm, we had whole day to spend at Sorrento. The ferry’s on board facilities were wonderful with cafes, toilets, kids play area and viewing deck. I definitely went up to the top deck. I was soaking myself in the beauty of the sea, inhaling the sea breeze (and posing for photos once in a while), and 40 minutes just went by. We got off at Sorrento pier, it was a warm day so a lot of people were there at the beach. As we walked further from the pier, we realized that it was actually a crescent shaped beach, surrounded by beach lovers, jet skis and cafes. We chose a spot under a tree and took our time to relax and enjoy the beach. I bet if you had your own vehicle, it would be wonderful to go around the area and explore its historical beauty, however, we were bound to the beach (not complaining). View as we left Queenscliff Harbour- it was a bit cloudy but the day got better later on. I could spend my entire day just sitting by the beach – taking a dip, collecting those teeny weeny perfectly shaped sea shells, looking at the sea birds, BUT the fish and chips being served at the nearby café looked irresistible. We had our lunch and took a short walk near the coast line. It was already 4:30pm by then so we decided to take the next ferry back to Queenscliff. We hopped onto the ferry, which is very conveniently located beside the beach, grabbed a cup of coffee and headed up to the deck again to take in all I can until next time. Plan ahead – If you are relying on public transport, I would suggest on planning ahead to avoid unnecessary waiting time as bus no 56 is not as frequent as the other buses. Booking tickets online is available but not that necessary for foot passenger (but if you want to avoid queuing, you can definitely do that). Be prepared to be wrapped in the beauty of blue blanket of the sea and have an awesome time. View from top deck as we were left Sorrento pier.